April set CO2 records for daily, weekly, and monthly measurements. Graphic courtesy of NOAA. April was a landmark month for CO2 readings on Mount Mauna Loa, Hawaii. As the accompanying graphic shows, all-time highs were established for daily, weekly, and monthly readings. Notice also the lonely dot representing the daily measurement for August 28. That will almost certainly be the last time a daily reading comes in under 400 parts per million (ppm) for a long time. Pre-industrial CO2 was around 280 ppm. The amount of carbon dioxide in the atmosphere is rising. Many scientists agree that this increase leads to an increase in trapping heat radiated by the Earth. The result, based on the information we currently have, will be warming of the Earth-atmosphere system. This conclusion is corroborated by both instrument and satellite measurements. According to the records we have, the increase began with the Industrial Revolution, since which time the human population of the planet has burned increasing amounts of coal, natural gas, and oil. When it comes to graphs, that is. Decoded Science has repeatedly pointed out how statistics can be used in misleading ways. The graphs of carbon dioxide in the atmosphere with time here make that clear. In the graph on the right, the recent change looks fairly benign. But the graph on the left shows that the recent rise is unprecedented in the last 800,000 years. Two graphic views of atmospheric carbon dioxide: last 800,000 years on the left; last 65 years on the right. Graphic courtesy of EPA. 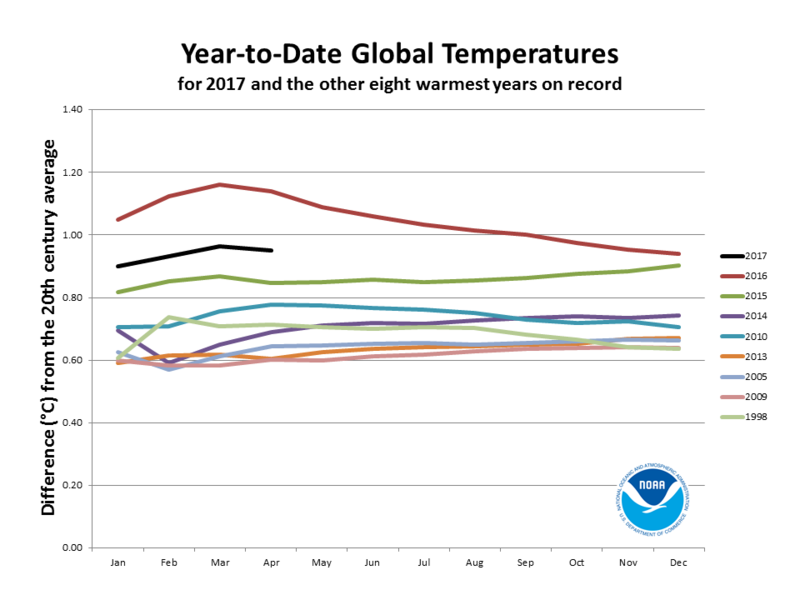 NOAA released its April 2017 Global Land And Sea Analysis of temperature on May 18, 2017. Nothing new to report. Some records were set over the Atlantic and Pacific Oceans, but land areas averaged out cooler than the Aprils of several recent years. Overall, April 2017 was second only to April 2016. Warmth in the eastern US and Europe balanced cold in Canada and Asia. The warm oceans, helped by the demise of the recent La Niña and a trend towards El Niño, pushed the average into second place. But whether the whole year slides behind 2015 or surges past 2016 (Many climate models predict a new El Niño, which might make that happen), the last three years are the hottest on record by a wide margin. The historic agreement signed by 190 countries at COP 21 (21st Conference of the Parties) is now in effect. Since the pledges made pursuant to that agreement are voluntary and in any event mostly won’t take effect for some time, there is not much to report as far as any influence on climate change is concerned. However, the Parties meet annually to review things, and the conference coming up in November (COP 23) could be particularly important. As a prelude to COP 23, the recent Forty-sixth sessions of the Subsidiary Body for Implementation (SBI 46) and Subsidiary Body for Scientific and Technological Advice (SBSTA 46) as well as the third part of the first session of the Ad Hoc Working Group on the Paris Agreement (APA 1-3) concluded in Bonn, Germany yesterday. Such a preliminary conference would normally hold as much interest as a sleeping dog (I guess you could argue over whether or not to let it lie). But this was different for a couple of reasons. First, the President of the Conference is now Frank Bainimarama, the Prime Minister of Fiji, a nation that could disappear into the ocean if global warming continues. He may inject more urgency into the discussion. Second, the attitude of the current US administration toward the agreement has been — let’s just say — flexible. The US delegation consisted of seven individuals, fewer than Zimbabwe sent, and they were generally not engaged in the discussion. All of the actions taken with respect to carbon dioxide emissions are voluntary. There are no prescribed penalties for failure to adhere to promised reductions in emissions. There are, in fact, no prescribed methods for measuring emissions reductions. Any nation can withdraw from the agreement on relatively short notice. A relatively wide gulf remains between developed and developing nations. On that last point, it is not hard to understand the positions of the two classes of emitters: Developing nations want to live like developed ones — which means using more energy, the cheapest forms of which are the most polluting; developed nations don’t want to give up the way they live, including using lots of energy. Decoded Science believes that as more people feel the effects of climate change, the emphasis will shift from the question of how much should be done to the question of who will pay for it. COP 21 began the discussion of that question, and it will continue at COP 23. I think the shift from “How much should be done?” to “Who should pay for it?” is already taking place. For most people it is hard to understand what it in regards of CO2 atmosphere concentration we actually talking about. Here is a simple explanation that everybody can understand. Let’s say a Lottery Syndicate wins one million dollar and this money is distributed like the gas concentrations in the atmosphere. Then Nitrogen would get $ 750,000, Oxygen would get $ 220,000. The water dissolved in the atmosphere would get approximately $10,000.00 but if you are CO2 you would get only $ 400.00 but that you have to share with nature. So if you are human then you are only getting $12.00. That is what we talking about, we totally ignoring water with $ 10,000.00 but we worry about the $12.00 that we won’t to desperately reduce. That makes no sense it all. There is about 300 km of atmosphere above us; this amount compressed so that it would be the same pressure as on the street in front of your house would still be higher that height Mount Everest above us.